Welcome back. Today’s blog post continues Sharon F.’s visit to Ireland as she delves into daffodils. If you missed it, Sharon’s travel began last Friday (Touring Ireland--Waterfalls). Q. What’s Green and Yellow in Spring? 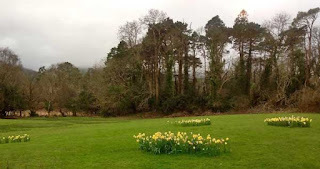 A. Ireland with Daffodils. 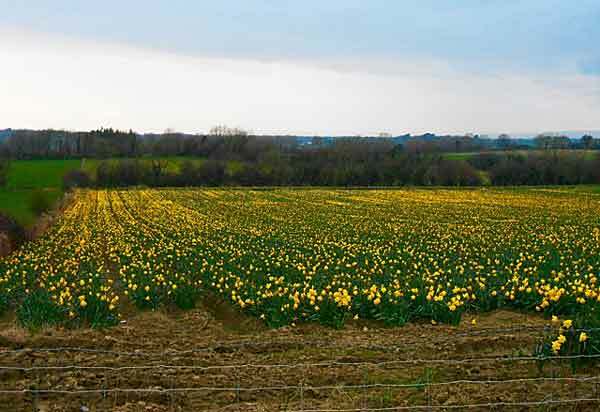 Even in my cramped back seat in the car, I could see crowds of daffodils everywhere we went in Ireland. 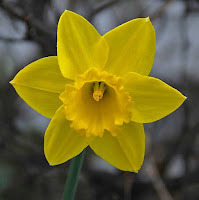 Daffodils are part of the Narcissus genus of spring perennial plants that flourish in many places of the world including North America, Europe and North Africa. A trumpet-shaped corona surmounts their jaunty six petal flowers. 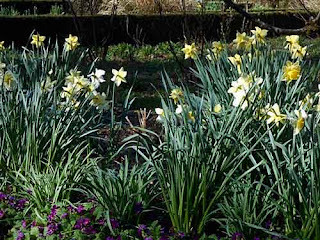 Usually, daffodils are white, yellow or orange. Daffodils were popular in ancient Greece and Rome where it was believed they had healing powers. Roman invaders brought the bulbs with them as they marched across Europe. The bulbs are very hardy and resistant to voracious deer and squirrels. 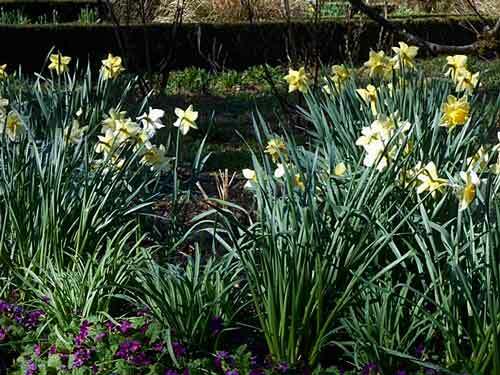 The bulbs multiply rapidly and form large, long-lived clumps that reappear every spring. In Ireland, we saw huge drifts of daffodils lining highways and tiny laneways. The banks of rivers, forest edges and parks were filled with massive plantings that brightened even the cloudiest day. The Irish Cancer Society, like many cancer societies worldwide, has adopted this yellow beauty as part of their Campaign of Hope. The annual Daffodil Day fundraiser brightens not only the roadsides but also people’s lives. It’s easy to plant daffodils in the fall and see a lovely reward each spring--no matter where you roam! 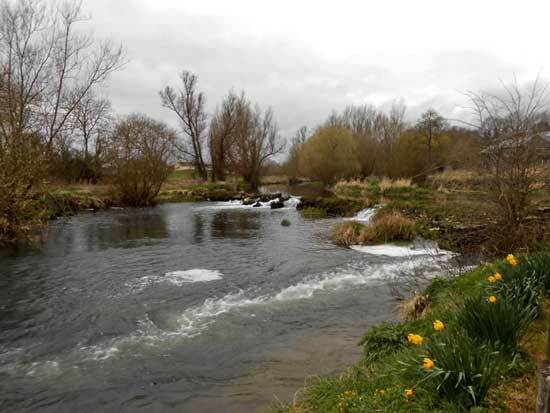 A host, of golden daffodils…"
Once again, thank you to Sharon for sharing her adventures and to you for joining us. You can find other essays by Sharon on the Stage of Life website (www.stageoflife.com), where she posts on the Empty Nest and Retirement Stage under the name Silver Fox.